Fender's take on trying to get EC's strat to sound like a Gibson. Some people seem to like it a lot, while others.. Not so much. But as i stumbled on a schematic, i thought this could work well as a pedal. With four transistors and not-so-simple design, there's little chance of fitting this onboard any guitar.. There are some non-standard values for the resistors, but as always, you should be fine with the closest ones you have. The layout doesn't have the magical TBX Tone control in it, but i've added another image that shows how to wire it up. If adding the TBX, any idea where you would connect the guitar input to the pot? John, looks like it is wired just like a simple tone control....parallel (to ground) with the input. I have a 1987 Fender Strat Plus with TBX tone control and it's pretty cool. I personally don't use tone controls ever but those who do should like it. To reduce the gain to 12dB you must add a pair of resistors in the MDX pot. Now, I have searched for a schematic, for this, and all the ones I have found include a 330K or 332K resistor to ground, at the base of Q1, which your layout does not include. Just FYI, when I tried to surf to the guitarwork.ru site my virus detection lit up like a Christmas tree. Mirosol, I have built this and it works. I had to use a 100K volume pot because the circuit oscillated with the 250K pot at the mid point of the rotation range. Works with all kind of transistors including germaniums. Strange thing with the pot value.. I'll tag it anyway. Cheers! Hi, I made one too with Frederic's correction and as coi2001 I have a resonance and an oscillation when the volume pot is at 12 and when the mid pot is at max. The volume pot works as a master up to 12 and after it change the frequency response and the mid pot just increase the boost. I don't know how it supposed to work, but it's fun. Can this circuit be used with both active and passive pickups? I assume that the wires 'Volume 1, Volume 2 and Volume 3' go to the connectors of the volume potentiometer. Same thing with the tone pot. But are you counting the pot connectors from the bottom or the top side? Initially, it was a dual preamp stage, the second one being an op amp. Both have a little tone correction. I am a French engineer and I have designed exactly the same preamp with a simpler design. It gives exactly the same result but is way simpler to achieve. Would you like me to post it? I'd love to share. But how do I upload the schematics? upload to imgur ,then share the link? Thanks for the circuit! I've just built it, and I have to unfortunately confirm it oscillates with 250K volume pot. Would there be any tip how to get rid of that - other than lowering the resistance of the pot? Many thanks! OK, I've found out why the circuit might oscilate - all the "original" Fender schematics use only 50K(!) pot for the volume. I'll replace my 250K with 50K in my guitar during the week and will post the results here. Cheers! I had the same problem - self-oscillation! - and it's true: after changing the volume pot to a 50k and putting the 250k to the mid boost knob everything works as expected! areyouexperienced.net also makes a note on this fact easily overlooked. Great layout! I found the schematic on the web and was drafting it out in DIYLC when I found the layout here. This saved me a ton of time. The resulting circuit is super clean. Even inline between my guitar and amp unboxed or shielded it is quiet without inducing hum or noise. The mid boost adds a nice amount of gain as you roll it on and it really fattens up the tone as it pushes the front of the amp. I'm using PN2222A transistors for my NPN transistors and the 2N5087 for the PNP. The only part I didn't have in my bin was a trustworthy PNP transistor so the total cost for this build in new parts was a 55 cent transistor from Digikey. 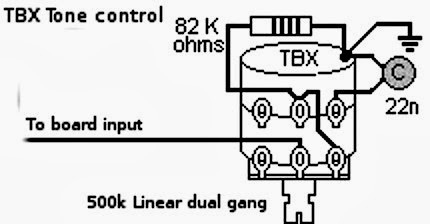 I'm using Log potentiometers 50K for volume 250K for mid-boost, as per the original schematic. I haven't tried a 250K for the volume yet but I will be experimenting with different values. 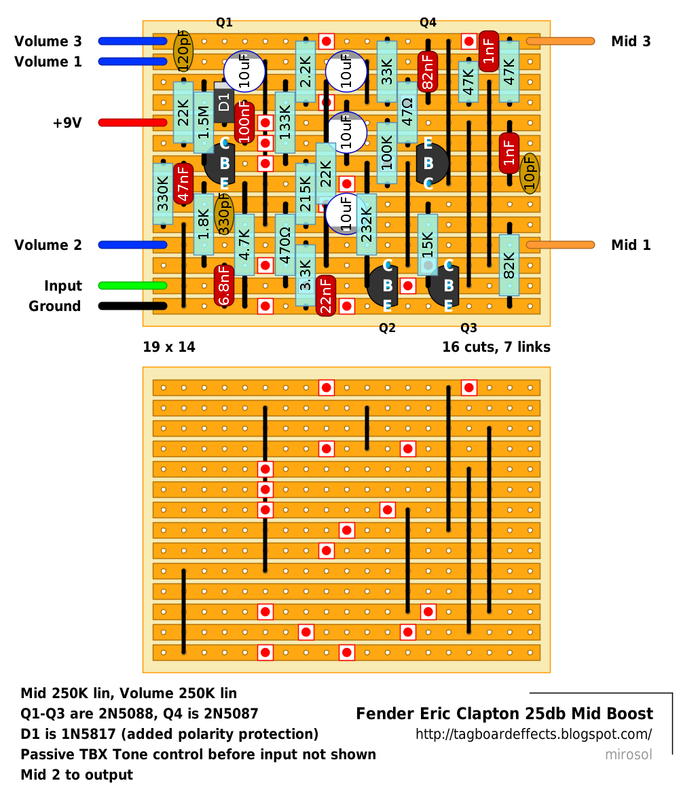 They use this circuit in the Fender Custom Shop Andy Summers Tribute Telecaster guitar and it uses a fairly standard telecaster volume control and tone stack so it should be possible to use it with a 250K volume but maybe not quite as it is wired in this layout. I'll post back once I'm done. Just a quick update regarding some experimenting with the volume control value. 50K seems to be optimum for a clean volume control. Anything higher starts to distort the signal at the top of the volume regardless of where the mid boost potentiometer is positioned. I'm using a stacked set of 250K Log pots so to bring it down, I've paralleled a pair of 70K resistors with the legs of my volume potentiometer. This gives approximates the 50K value necessary and it doesn't seem to skew the rate of control badly. One more update based on my testing and observations. In the design above generously posted by Mirosol, the volume control tends to present a problem because it should be a 50K potentiometer but is marked 250K. It's not a huge deal and as I noted above, you can either use a 50K potentiometer or parallel resistors across the larger value potentiometer to tailor the resistance to 50K. Another option, especially if the preamp is going to be mounted onboard your guitar is to remove the volume control from the preamp circuit and use the one in the guitar. I've modded mine for this and for my use, it makes for a much more useful unit. To achieve this omit the volume control pot from the layout, tie the leads from Volume 3 and Volume 2 together; ignore the lead for Volume 1, it's just a ground wire. Input, output and the mid control stay the same. This is how it will be installed in my Andy Summers inspired Telecaster and it will rock! I hope I'm not chiming in too late but all the information here is very good. Unlike Fender's circuit where the mid boost is always in the circuit, does the modification above bypass the boost when it is off? mmm Built it using this layout. mid control works like a reversed volume so no sound when fully ccw so I can say the mid boost part is not working...where have I gone wrong!? Used 5088s and 3906 as the pnp - wiring and soldering seems ok.